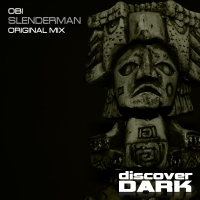 Hot on the heels of Shevannai, Obi's recent release on Discover, he continues to impress, this time by flexing his psy influenced trance muscles with Slenderman on Discover Dark. Typified by strong melodies, a driving percussive bottom end and superb production trickery, this is Obi at his very best. Combining a wealth of cool influences and a finely tuned production ear to create another devastating dance floor destroyer!!! 'Slenderman' is available now from Beatport and iTunes.